At the edge of turquoise waters lay the deep blue abyss of the Pacific. A couple in yellow kayaks paddled in solitude in the distance. I snorkelled lazily, hugging the necklace of sand that framed a piece of paradise called Motu Tautau Island, part of the coral reef surrounding the larger island of Taha’a. I was now alone except for a small stingray that glided silently over the sandy bottom. My first glimpse of Papeete was from the back of a shuttle bus as I headed to Le Meridian Hotel. It was pitch black but for the main road street lights. Along the roadside young kids hung out in small groups, up to no good it seemed. Elsewhere, in dimly lit parking lots or side streets, Mercedes vans known locally as Roulottes with swing-open side panels were serving steak and frites to diners. In the morning I wandered Boulevard Pomare and explored back alleys and side streets. The town’s old colonial buildings are worth discovering, along with a vibrant market and bustling waterfront. In the midday humidity, I slumped into a Parisian-style chair and ordered a cold Hinano beer and watched the leisurely pace of Tahiti life trickle past me. In the café, as ex-pats chatted animatedly in French between sips of black coffee, the ceiling fans above them hacked at slabs of cigarette smoke. Brightly coloured pareus (sarongs) fluttered in the breeze on street stalls. ? ?A picturesque church known as Notre Dame Cathedral caught my eye, as did the local vividly painted buses – converted Mercedes trucks!? ?Inside the Municipal Market, tropical fruits, vegetables and seafood were being displayed and sold. The upper level housed Tahitian arts and crafts and a popular café with a ukulele fuelled Tahitian band in full swing. Food is as popular here as it is in France, so it came as no surprise to find Tahitian, French, Japanese and Chinese restaurants scattered throughout the town. An hour’s flight from Tahiti, and I caught sight of the landing strip on the remote and unspoilt island of Huahine – nicknamed ‘The Garden of Eden. Huahine is actually two islands, joined by a narrow isthmus and encircled by turquoise lagoons lapping at an outer barrier reef.Paul was a tour guide with a degree in anthropology and, on a three hour tour of the island, he explained its history, diversity and how island life sustains itself. Huahine had a total of eight villages, four on each island, and a population of roughly six thousand people living on this spectacular dot in the ocean. “French Polynesia,” Paul went on to explain, “is roughly the size of Europe!” Huahine, in Tahiti’s Leeward Islands, by contrast is just 74sqkm; an island that is off-the-beaten-track in more ways than one. “It’s not like you’ll find truck loads of holidaymakers wandering this slice of heaven. 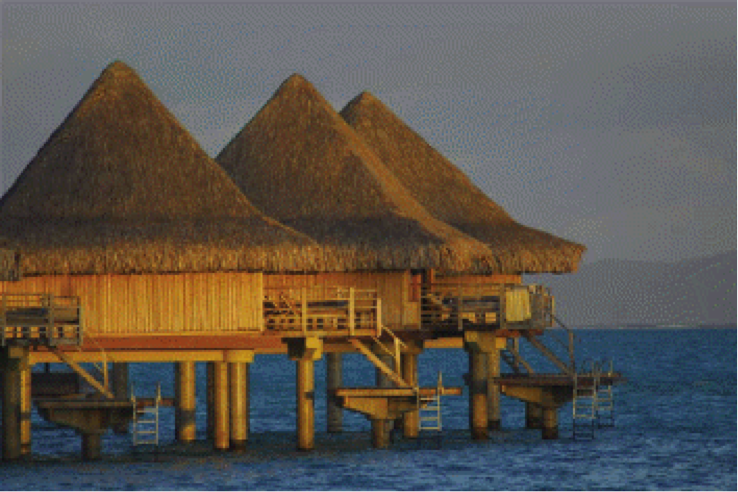 They much prefer Moorea or Bora Bora instead,” added Paul. At a restored Tahitian marae, the flattened royal ruins were over 500 years old. This was once a place of temples and dwellings and human sacrifice, the last one occurring in 1818. Their story is of an ancient culture; nearby their centuries’ old stone fish traps are still used today. Huahine has no snakes or poisonous plants, but is rich in vegetation and agriculture – mango, banana, papaya, watermelons and cantaloupes. The islanders also grow coffee and harvest vanilla and taro from large plantations, and plentiful groves of breadfruit are still a staple part of their daily diet – true Tahitian bounty. Huahine offers surfers massive waves at Avamoa Pass and each year in October the annual Hawaiki Nui Va’a outrigger canoe race begins here. Eighty or more outrigger canoes competing in one of the world’s toughest races is a sight and spectacle worth observing once in your life.? ?Tucked away in a small bay and only accessible by boat was the Te Tiare Beach Resort – Huahine’s main accommodation option. Here in lush tropical surroundings, calmness settles over everyone. It’s a location that most people dream about, the coveted opportunity to swim in turquoise waters and laze on sun-kissed white sands below jungle-like emerald green rugged mountains. The capital of the Leeward Islands is located 220km from Tahiti. Raiatea is referred to as ‘The Sacred Islands’ and is regarded as the cradle of Polynesian civilisation. Historically this was where many kings from neighbouring islands would gather for negotiations and ceremonial events. How right Iris was. To the west, the last rays of sunshine turned the sky and the clouds the colour of a ripe mango. From my bungalow I could hear French accents drifting on a light breeze, the tide splashed the shoreline and palm trees fluttered in tune – as harmonious as it was romantic. The coastline here would have hardly changed from the days when Captain Cook sailed by in the Endeavour. Abundant fresh water and a profusion of fruit, with flowers such as like hibiscus, bougainvillea and yellow jasmine. Thatched huts with tall curving palms arched over sandy beaches and breaking waves with an interior backdrop that still looks uninhabitable. As a group of us headed to the 5-star Le Taha’a Island Resort in a small boat, a hose blew on the water pump and smoke rose from below the floorboards – it was not a scheduled stop, but to have a boat suddenly die while drifting in a stunning turquoise lagoon was paradise found. In the shade of the resort’s coconut palms a couple drank Moët by the pool, some men played boules in the shade, a couple frolicked in the knee-deep lagoon, two women lay on chaise lounges as frigate birds spiralled on thermals high above. The air was breezy and dry, the water warm and rippled, the location quiet and blissful. The wind wrapped itself around my face, bringing with it delicious aromas from the restaurant. Bora Bora is often described as the most beautiful island in the world and as such bears the moniker of ‘The Romantic Island.’ Only 29km in circumference the island has a backdrop of majestic mountains split by waterfalls and cataracts amid drifting, claggy, moisture laden clouds. In the distance there’s the ever present sound of breaking surf discharging into the aquamarine lagoons. The island is dotted with world class resorts offering world class facilities and activities; jeep tours into the interior, shark feeding forays, deep sea fishing, kayaking and scuba diving in some of the clearest waters of French Polynesia. Outrigger canoe racing is the national sport in this part of the Pacific and it’s easy to see why. With thousands of others I stood in waist-deep water watching the last of the Hawaiki Nui Va’a outrigger canoe teams make it to shore after three days of racing. On this particular day, Tahitians and tourists alike come together, just as they did on Captain Cook’s historic visit. “This morning we had a great many canoes about the ship, the most of them came from the westward but brought nothing with them but a few coconuts.” It’s easy to see just what makes Tahiti so alluring to visitors – in that respect, very little has changed since Captain Cook wrote those words in his journal. Hawaiki Nui va’a (Outrigger Races) will take place again late October 2010.